QEMSCAN® is the world’s leading technology for rapid mineral analysis. It is revolutionising the mining industry and is in demand from the world’s largest mining companies. QEMSCAN® provides users with rapid determination of composition, size and shape of fine particles using scanning electron microscopy and X-ray techniques. The technology has the capacity to make 12 000 mineral analyses per minute. QEMSCAN® is used to assess the value of exploration discoveries and to streamline metallurgical processes. Data from QEMSCAN® assists operators to manage the whole process from exploration, planning the mine, scheduling production, and processing ores of different grades ‘ right down to the dregs and what were once regarded as waste stockpiles. In 2003 CSIRO spin-off company Intellection Pty Ltd was formed to commercialise the technology. 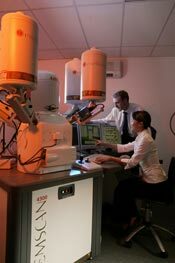 The commercialisation of QEM*SEM® technology, which underpins QEMSCAN®, won a CSIRO Business Excellence Medal in 2006.